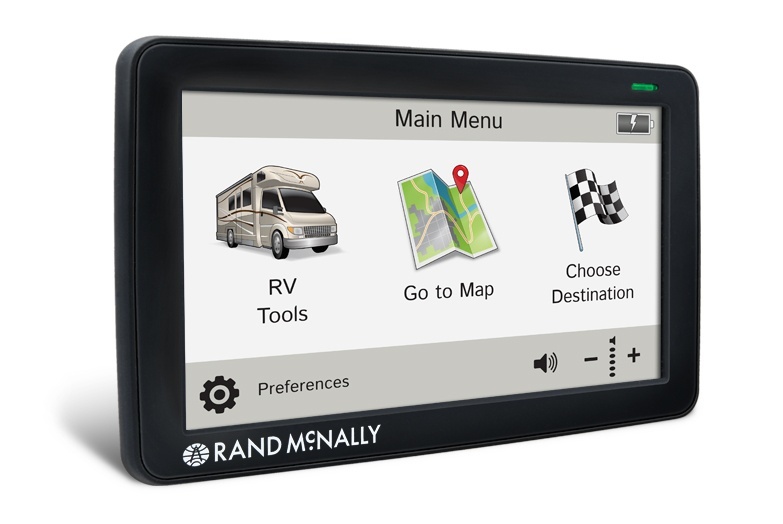 With updated hardware, a faster processor, and three user interface options, this is our best RV GPS device yet. Features include toll costs, advanced lane guidance, millions of RV points of interest, and award-winning routing from Rand McNally. An RV adventure is more than an ordinary car trip. Which is why you need more than your car GPS. The RVND™ was designed to meet the unique challenges of driving an RV, with award-winning routing and tools that help you plan, prepare, and enjoy the ride. Choose your vehicle from 11 different RV types, including Class A, fifth wheel, and travel trailer. The RVND™ accounts for propane restrictions and even right- or left-hand turn preferences. Or switch to car mode for everyday use. Weather—Dynamic weather data, including current and forecasted information for your current location, destination, and anywhere along your route. Choose from 10 different live map overlays to display important information for RVers, such as wind speed and precipitation. Fuel prices—View fuel prices on the map, or search by price, fuel type, or brand. Local search—Find local businesses, restaurants, and more by name or keyword. The GPS comes with a 1 year limited factory warranty. The Heavy Duty RV Box backup camera Has a 120° Degree viewable angle, its waterproof and has auto night vision. The backup camera is THE MOST durable we have, with incredible adjustability and night vision clarity. The RV Box backup camera has a metal sun shield visor to protect you from glare and pebbles. This is by far our toughest built backup camera, it can be pounded hard and still operate without issue. Like our other cameras, It has been regularly used in cars, vans, buses and even industrial sized caterpillar trucks, operated in the harsh oil sand of Canada. This backup camera can take a direct hit from a rock and it will still work like new. It has also been very popular with RVs, because its housing allows you to install the backup cameras on multiple sides of your RV. You can also make this camera WIRELESS. That means you do not have to run a cable from the back of the RV to the GPS unit. The wireless will transit up to 70ft without an issue. We have longer range systems if needed. You can also upgrade this camera to a CCD lens. The CCD lens is the clearest and highest quality backup camera TadiBrothers sells.